Ellenborough Falls is located approximately 5 and a half hours north of Sydney on the Bulga Plateau at Elands. It is approximately 1 hour and 50 minute drive inland from the beachside town of Old Bar, where we stayed a few nights at the fantastic Meridian Resort. Driving pass the town of Taree and Wingham on Bulga Road from Bobin, the road is unsealed for about 15kms before turning into Ellenborough Falls Rd at Elands. We visited the Ellenborough Falls on the June long weekend of 2014, the winter air was cold and crisps and the sky was overcast with low grey clouds hovering above the luscious rainforest canopy. Luckily the weather held up long enough for us to explore the nearby tracks before it rained. 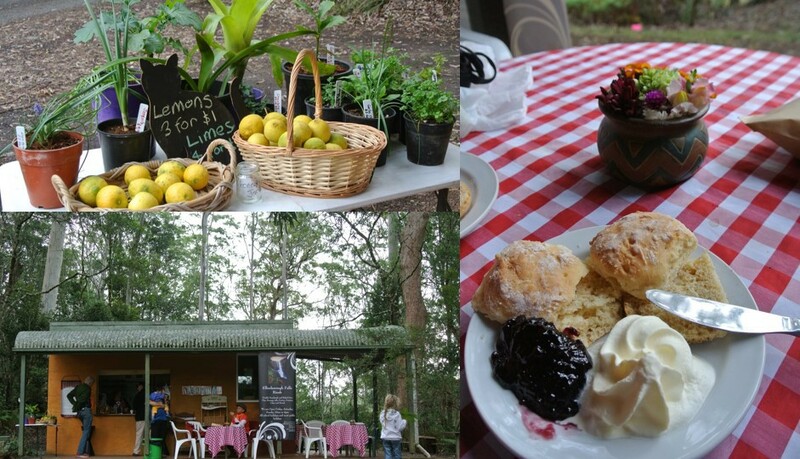 Located near the car park are the toilet amenities, picnic tables, an information board and the rustic country style 'Ellenborough Falls Kiosk' – they serve amazing scones with coffee/tea and freshly made gourmet sandwiches, an absolute treat after finishing the lower falls track. 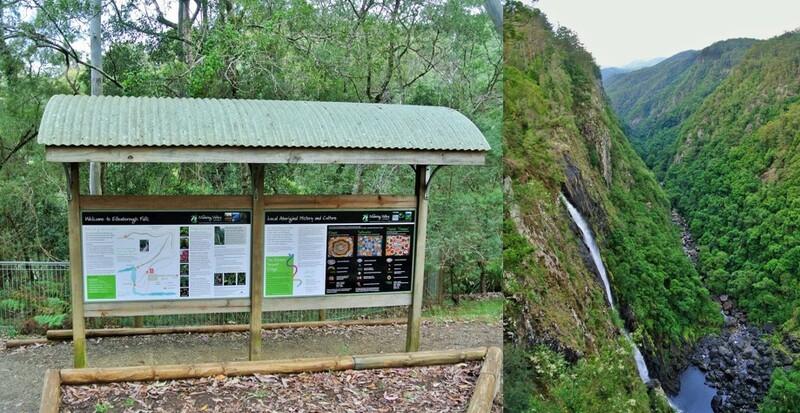 The main viewing platform closest to the car park is constructed out of timber extending about 6 metres from the cliff some 200 metres above the valley floor, providing a side profile view of the waterfall, the gorge and the Bulga Plateau into the distant horizon. 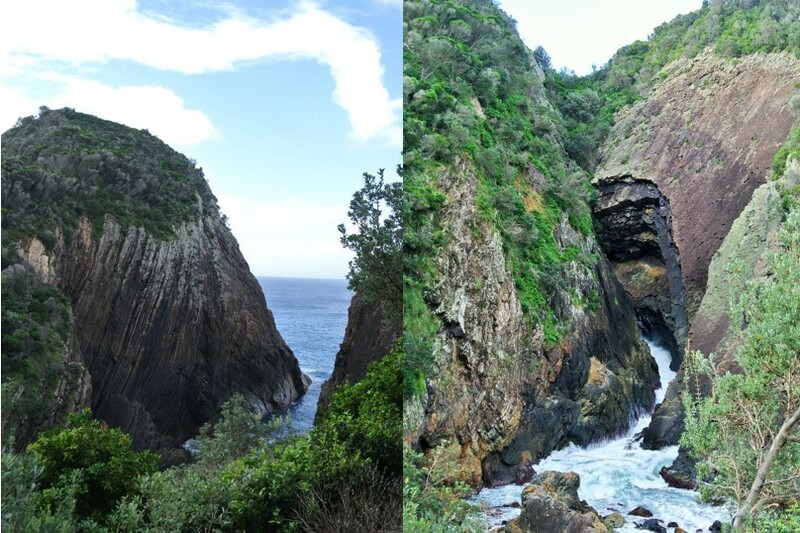 From this lookout, you can see the Ellenborough River flowing through the cavity at the top of the rocky cliff before plunging some 160 metres creating that horsetail waterfall display. The sign board says 641 steps to the base of the falls, the timber walkway winds its way down the mountain through the subtropical rainforest passing lushious green ground ferns, vines, moss covered tree trunks and rocks, Epiphytes, palms, wild mushrooms and huge Morton Bay Fig trees. The timber stairs can be slippery when wet, mind your footings where the wooden planks or steps are broken and make use of the many rest spots along the way. The viewing platform is situated adjacent to the rock pool at the base of the falls. Looking up, you can appreciate the height in which the waterfall drops from before crashing into the basalt rocky base below creating a mass amount of water sprays and mist - lean over the platform and you will get wet. To capture the full length of the fall from the base you will need a wide angle lens camera. The sign also said a 'comfortable 30 minute walk' on the way down would be appropriate however, on return it is quiet strenuous. So take your time and enjoy the tranquil ambience of the rainforest and therapeutic sound of the waterfall and enjoy the journey back to the top. This track is a 10 minute short walk up and around a hill where the viewing platform is directly facing the Ellenborough Falls, offering the most magnificent panoramic views of the waterfall against the escapement. The Ellenborough Falls Kiosk brings the wilderness to life with glorious aromas of baked pies, pastries, scones and freshly brewed coffee. Every day during NSW School Holidays. Special catering is available for school excursions, bus tours, community groups, family gatherings and special occasions. Old Bar is located approximately 3 and a half hours drive north of Sydney. This is one of my favourite self-contained beach front accommodations, the ground floor beach front apartments provides direct access to the backyard (fully fenced) perfect for kids to run freely. The beach access takes you down onto the pebbly beach, great for morning and evening walks at low tide. 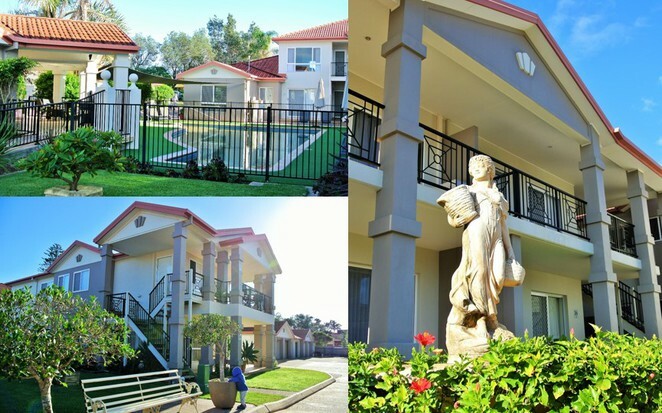 The resort itself has a great appeal, wonderfully presented with manicured lawns offering outdoor pool and spa, games rooms, BBQ area, stunning ocean views and more. We were told that the dolphins sometimes swim up very close to the shore and you could spot them from the backyard or ocean front balconies. View the video produced by Armedia Photography of the pod of Dolphins swimming off Old Bar Beach here. Unfortunately the area has been experiencing severe sand erosion and as part of the Coastal Zone Management Plan, the Greater Taree City Council is looking to implement a rock revetment in the affected areas. Seal Rocks is a small picturesque idyllic beach seaside town located within Myall Lakes National Park. Located approximately 1 hour and 15mins south of Old Bar, it makes a perfect detour on the way back home to Sydney. 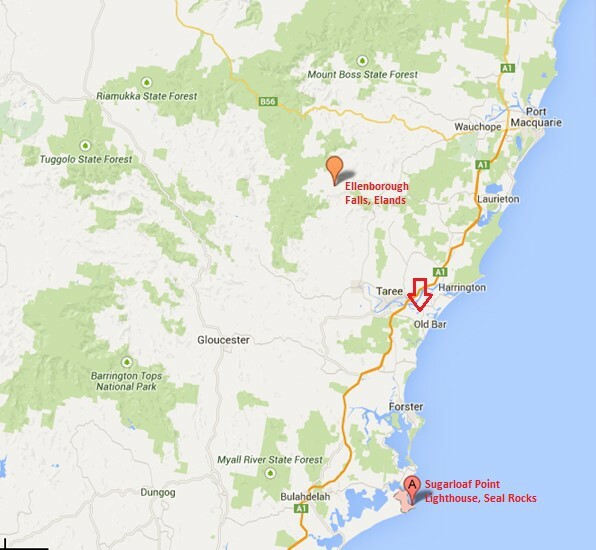 Take the Tuncurry Road exit from the Pacific Hwy towards Tourist Drive6 and follow The Lakes Way to Seal Rocks. Once you reach the clearing, there is a car park and toilet amenities by the beach opposite the North Coast Holiday Parks. There is also a caravan Kiosk on site selling hot coffee and snacks. Up the road on the hill, opposite the little corner store, sit down on 'Andy's Corner' bench and take in the spectacular views of the turquoise water of the bay. To get to Sugarloaf Point Lighthouse continue along the narrow road passing the corner store and some homes until you reach the car park. Sugar Loaf Point is open from sunrise to sunset and closed from dusk to dawn. The 15 metre high lighthouse is heritage listed, built in 1875 and includes a signal house and two lighthouse keepers cottages. It is a short 10 minute walk up the hill to the lighthouse passing native bushland and two stunning blow holes until you reach the cottages. You will want to pause for a few minutes to take in the amazing views of the coastline before tackling the steep 100m walk up to the light tower. The 360 degrees views of Myall Lakes, the ocean and stretches of golden beaches is breathtaking and even more spectacular when you see a rainbow after a light sun shower. It makes for a perfect whale watching location, the sign boards shows the different species that visit the area during migration season. Also look out for large birds of prey, the white-bellied sea eagle and whistling kite are known to glide pass the cliffs. This trip was one of my favourites, I hope you enjoyed your visit.